The X1-RM universal radiometer & photometer is a rack-mountable variant of the X1 series hand held meters. It is a microprocessor-based measurement device that is combined with light detectors to measure light in different quantities. It combines a powerful electronic design in a rack-mountable housing for integration into 19" rack inserts modules with 3HE. The instrument can also be custom labeled, set up with custom design firmware and/or detectors designed to individual OEM customer specifications. 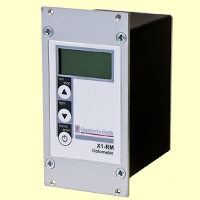 A unique feature of the X1-RM is its capability to operate multi-cell detector heads with up to four photodiodes with all four signals displayed on its four line display with on/off backlighting. The flexibility to combine the X1-RM with most of the Gigahertz-Optik light detector heads enable them to be used in a wide application range of radiometric, photometric and colorimetric measurements. The X1-RM provides a high linear current to voltage converting amplifier with seven manually or automatically selected gain ranges. The max. error within this wide dynamic range is 0.2 %. The four signal inputs operate in multiplex mode with one amplifier. Four additional analogue voltage inputs channels enable the X1-RM to control signals of additional sensors, e.g. temperature sensors. Manual operation of the X1-RM is simple. Once set up, all settings are stored and recalled on next power-up unless reprogrammed. Measurement values are displayed in absolute quantities for the particular detector connected. The meter set-up is supported by an easy to use menu. The menu allows selection of the operating mode, the detector and measurement parameter. Beside the manual operation, the X1-RM offers remote operation via its USB, RS485 or RS232 interface (slave mode). In manual or USB remote mode the X1-RM can also forward commands to connected lamp power supplies of Gigahertz-Optik�s LPS family via its RS485 interface. The X1-RM firmware is stored in flash-memory allowing simple firmware update via the USB-Interface without loss of the calibration data. The device is powered by 6 - 20 VDC.